Stay safe on your next trip. Not quite sure how many beers you had? This Personal Breath Alcohol Tester will give you a close reading of your blood alcohol level. Designed with audible alert and digital LCD display to tell you whether or not you should give up the keys.This is a fully functional breath alcohol tester with an internal alcohol sensor and even optional mouthpieces.You can quickly and easily estimate your BAC, Blood Alcohol Content, by blowing through the mouthpiece. You can take the product everywhere and test yourself, friends, family, or anyone who is curious about their Blood Alcohol Content.Everyone will want to test themselves whether you’re at a party, bar, restaurant, or anywhere else alcohol is consumed. Stay safe on your next trip. Not quite sure how many beers you had? This Personal Breath Alcohol Tester will give you a close reading of your blood alcohol level. 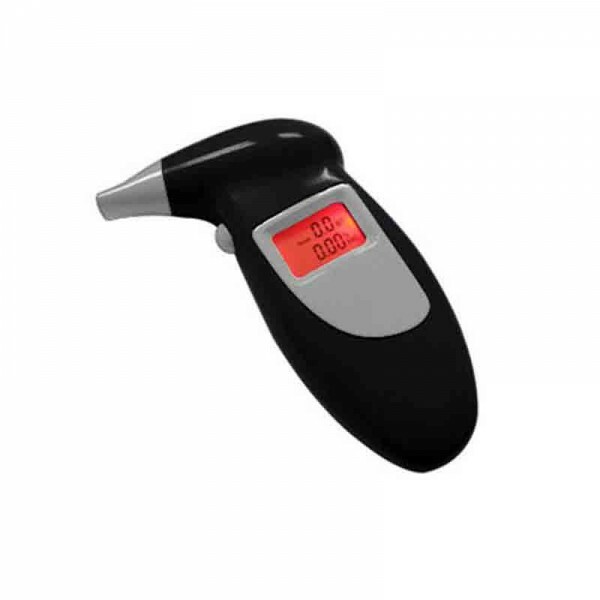 Designed with audible alert and digital LCD display to tell you whether or not you should give up the keys.This is a fully functional breath alcohol tester with an internal alcohol sensor and even optional mouthpieces.You can quickly and easily estimate your BAC, Blood Alcohol Content, by blowing through the mouthpiece. You can take the product everywhere and test yourself, friends, family, or anyone who is curious about their Blood Alcohol Content.Everyone will want to test themselves whether you’re at a party, bar, restaurant, or anywhere else alcohol is consumed. Learn how drinking alcohol affects your Blood Alcohol Content and always make smart, informed decisions. Press the power button once, the alcohol tester LCD will turn on with one beep sound. The “warm up” symbol is displayed, and the 10 to 00 countdown is started that indicate the tester is in warm-up mode. If first warm-up is defeated, the tester will be reset automatically and warm up again for 1-3 times. It always has a large number of gas & impurity adsorbed on the surface of alcohol tester, when first time taking out the tester from the packaging, or after long time no using for the tester, it need more time for cleaning and warm up the sensor, you should repress the power button and retry several times if possible. The “Blow” symbol is displayed when warm-up is succeed, and the 10 to 00 countdown is started that indicate the tester is in testing mode. Near and blow into the breath inhaler for 3-5 seconds. Read the test result from the alcohol tester LCD. After the result be display for about 10 seconds, the “OFF” symbol will appear for 2-3 seconds and the alcohol tester be turned off. If warm-off is defeated, the tester will automatically turned off. If no blow into the breath inhaler within 10 seconds in testing mode, the alcohol tester will be turned off after the LCD display the result “0.00% BAC & 0.0 g/l for about 10 seconds. The LCD flickering indicates low power of batteries, please replace two “AAA” alkaline batteries. When after drinking, it is recommended to last after 20 minutes, it is because 20 minutes is approximately for alcohol to be absorbed into blood from the digestive organs, and residual alcohol remaining in the mouth takes this long to dissipate. For accurate result, do not repeat next testing within 3 minutes after last time. Do not smoke and eat for 20 minutes prior testing. Do not use chemicals to clean the tester directly. Do not blowing liquid into the breath pipe. Do not use any excitant substances near the tester, such as paint, insecticides, alcohol. Do not place the tester in the closed environment with contaminated air. The result of this alcohol gives BAC for reference only, manufacturer does not to take any legal responsibility.